A Louisville police officer is arrested after detectives say surveillance cameras caught him punching a teen at school and placing another in a choke-hold. Police said the first incident took place Jan. 22 when Jonathan Hardin and the victim allegedly had an interaction in the school cafeteria after Hardin said the victim cut line during lunchtime. According to the warrant, Jonathan Hardin pushed and struck the victim in the face with a closed fist causing the victim to fall to the floor. 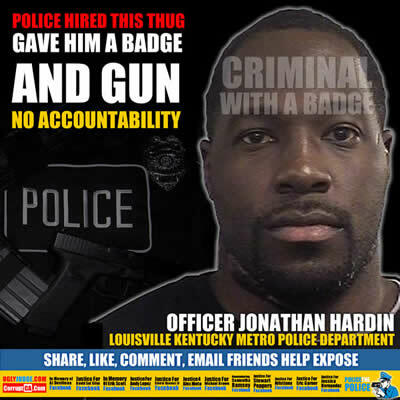 Jonathan Hardin then filled out a citation against the victim charging him with menacing and resisting arrest facts police said were false and he had no probable cause to do so. Police said the victim suffered injuries including pain, a laceration to the inside of the mouth and swelling to the face. The second incident happened Jan. 27 when Jonathan Hardin allegedly placed a 13-year-old in a choke hold which caused the victim to go unconscious, according to the warrant. Police said after this victim regained consciousness Jonathan Hardin handcuffed the victim. School surveillance cameras were rolling again on Jan. 27, when according to court records, Hardin placed another 13-year-old in a choke-hold, knocking him unconscious. According to court documents, when the student regained consciousness, Hardin handcuffed him. Court documents state Jonathan Hardin instead of getting the student medical help, he kept the student out of class for the remainder of the day, then drove him home. Hardin failed to tell the students’ parents what had occurred. A doctor later determined the student suffered brain damage.